It's time I finish what I've started, I gave my Gundam Build Fighters Impression back in October right after the first episode, and now I give you the Ani-TAY Gundam Build Fighters Review with the last episode 25. Gundam Build Fighters follow the story of Iori Sei, Gunpla Builder, and Aria von Reiji Asuna, a Gunpla Fighter where the duo teams up to compete in a Gunpla tournament for the championship. 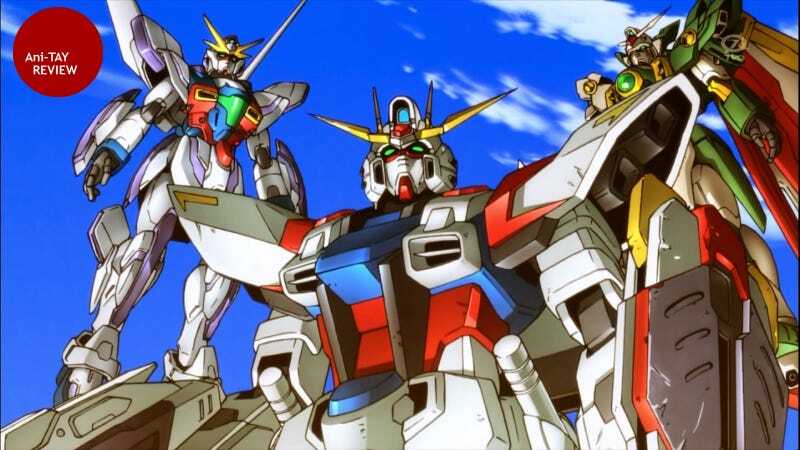 The Setting - Unlike many of the previous Gundam titles, Gundam Build Fighters takes place in a world similar to ours and Gundam is just a popular TV franchise. However, the biggest difference is that a technology exist to bring the Gunpla models to life and fight with them. Since the show revolves around Gunpla fighters, a lot of the show takes place in the arena where the mysterious Plavsky particles generate the field and bring the Gunpla to life. Characters - The main cast are fun. That's the best way to describe them. You won't find too many serious moments where you'll get a huge depth about their characters like other Gundam series but you learn enough about them only up to the point where it matters. Homage - Don't blink. Because this series is filled with homage to Gundam's long history from the Original all the way to more recent Gundam series such as Gundam 00. If you're a Gundam fan, you're going to enjoy trying to spot all of them. If you're not, and this is your first series, don't feel to bad, it won't get in the way of the plot. Gundam Designs - As with any mecha shows, mecha design is important. And there are plenty of Gundams to feast your eyes on. Unfortunately, since it's only a 25 episode series, there aren't enough screen time for all the models with some only lasting a few seconds to a few episodes before getting destroyed. The Battles - The series is all about fighting, so if you're looking for robot carnage, this is the anime you're looking for. The Opening - It's whimsical. The story - It's a kid show so there aren't anything too philosophical or too over the top in comparison to older Gundam series. The plot isn't too hard to follow and does not have too many ups nor downs. I'm not sure what to say here, I love the show. The only thing that's terrible is that it's too short. Also, both Rinko Iori and Aila Jyrkiainen need more screen time.